(CNN) -- A woman hospitalized after spending time in a sauna-like "sweatbox" has died, bringing the total fatalities to three, authorities said late Saturday. Retreat participants spent up to two hours inside the sweatbox, the sheriff's office said. The latest victim, Lizabeth Neuman, 49, was a Minnesota mother of three. She died at the Flagstaff Medical Center, the Yavapai County Sheriff's Office said. There were up to 65 visitors, ages 30 to 60, at the resort attending the "Spiritual Warrior" program by self-help expert James Arthur Ray, according to authorities. 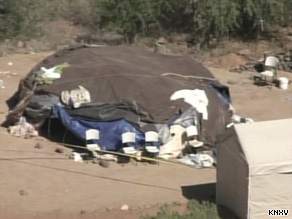 Participants spent up to two hours inside the sweatbox, a dome-like structure covered with tarps and blankets, the sheriff's office said. Hot rocks and water are used to create steam in the enclosed environment. Neuman's attorney, Lou Diesel, told CNN her family is cooperating with the investigation and once it's complete, he will "take all the appropriate actions in response to those responsible for Liz's death." Fire and rescue officials received an emergency call from the resort and transported the injured by air and land ambulances to nearby medical facilities, the sheriff's office said. Two people were pronounced dead shortly after arrival at a local medical center. A homicide investigation into the incident is under way, authorities said. The other retreat participants who were hospitalized have since been released. Ray is widely known for programs that claim to teach individuals how to create wealth from all aspects of their lives -- financially, mentally, physically and spiritually. He has appeared on various national programs, including CNN's "Larry King Live." CNN's Janet DiGiacomo contributed to this report.